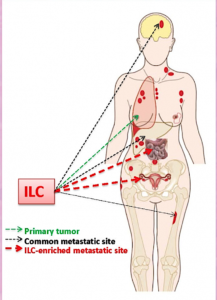 Patients with Metastatic Lobular Breast Cancer (cancer has spread beyond the breast to other parts of the body) have a unique opportunity to advance critical research by participating in the Metastatic Breast Cancer Project’s lobular breast cancer initiative. Email info@mbcproject.org with the subject line “Lobular”. Visit mbcproject.org and click “count me in” on the top right to sign up. In survey question # 11. “Tell us anything else you would like to about yourself or your cancer” enter “lobular” into the free text field. 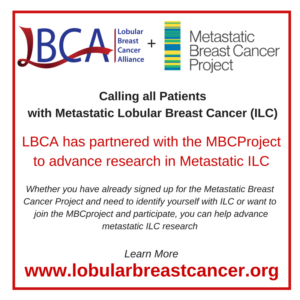 Patients who sign up for the the MBCproject can help researchers understand ILC’s unique metastatic patterns and behaviors which may lead to breakthroughs in understanding lobular metastatic disease. This project is only for patients with Metastatic Breast Cancer (also known as Stage 4). Spread the word to other patients with metastatic lobular breast cancer. Download and post an informational graphic on social media @LobularBCA #lobular #LBCA #breastcancer #bcsm. Who can join? All patients with metastatic breast cancer can sign up for the MBCProject, regardless of where they live in the world. While currently patients living outside the USA and Canada will not be included in tissue or medical records collection, they can still sign up to participate and help our understanding of metastatic breast cancer by providing information about their experiences with the disease through the intake survey and be included when the full study expands internationally. 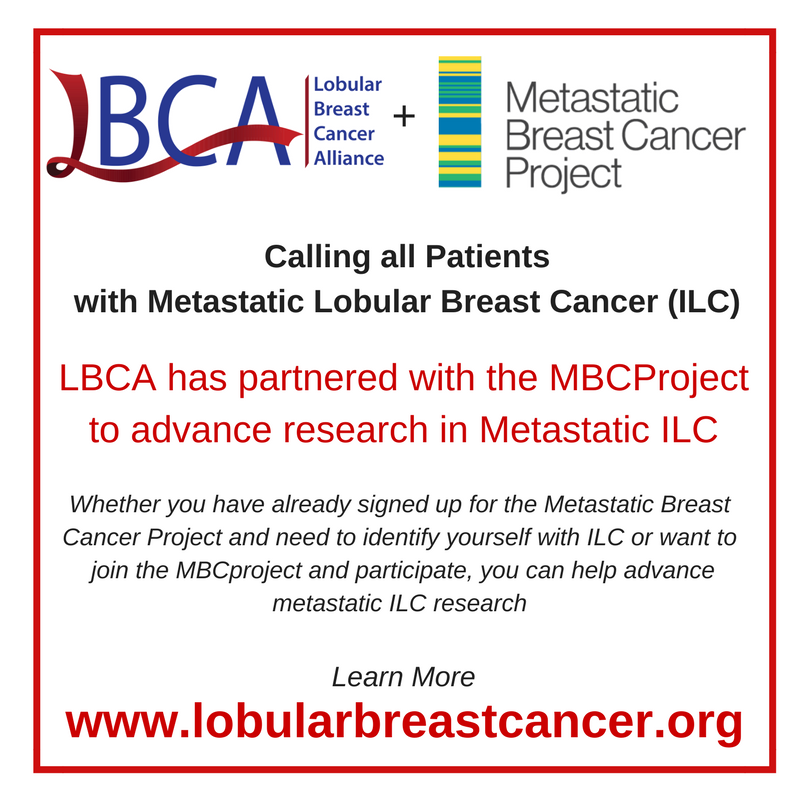 The Lobular Breast Cancer Alliance is pleased to partner with the Metastatic Breast Cancer Project. Our goal is to link patients with metastatic ILC who want to learn how to voluntarily contribute their tumor tissue samples with quality research. This partnership aims to fill an important gap that hinders research of metastatic lobular breast cancer so we can advance treatments faster. What is the Metastatic Breast Cancer Project? The MBCproject is a nationwide movement of patients, doctors, and scientists working with metastatic breast cancer patients and advocacy organizations. Metastatic breast cancer patients participate by sharing their tumor samples, their medical information, and their voice. The goal is to work together to speed the development of future therapies. The Metastatic Breast Cancer Project is led by a team at the Broad Institute of MIT and Harvard. The project shares de-identified genomic, clinical, and patient-reported data publicly to enable as many research scientists as possible to make discoveries in order to accelerate understanding of this disease. The Metastatic Breast Cancer Project is not managed by LBCA.